…the disciples woke him (Jesus) and said to him, “Teacher, don’t you care if we drown?” He got up, rebuked the wind and said to the waves, “Quiet! Be still!” Then the wind died down and it was completely calm. When we’re terrified by the reality of what we are facing in our boats, it’s easy to feel like Jesus is asleep or not in the boat with us at all. It’s easy to wonder if he loves us or cares about what is in our boats when the storm rages around us. When Jesus stood up and rebuked the storm with, “Quiet! Be still!” the disciples may have thought he was also speaking to them. Their hearts needed quietening from the storm within, just like the storm outside. They needed to remember that Jesus was in the boat with them and their fears and anxieties. They needed to see with their eyes and know in their hearts that he was in control, even when all around them felt otherwise. Jesus asks us for simple trust in the middle of furious squalls in our lives. He is in control. He’s in the boat with us. The winds, waves, troubles and fears are under his watchful and loving eyes. 1. What is threatening to capsize my boat today? 2. What is Jesus saying to me in the middle of my storm? 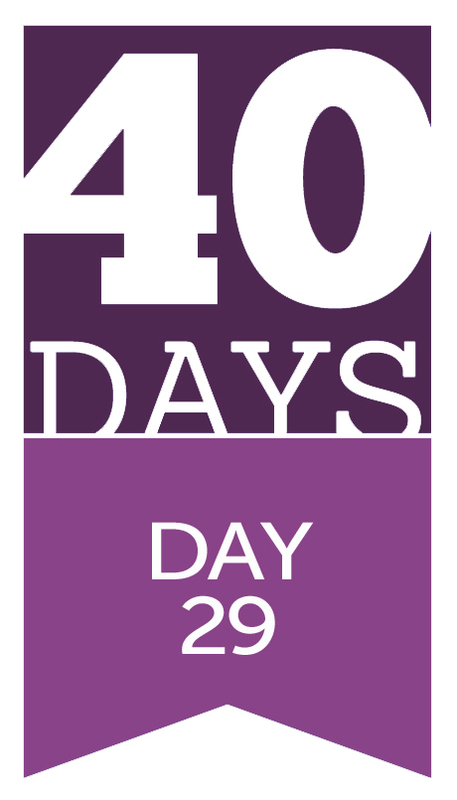 Sign up to receive the latest edition of the 40 Days Devotional posts by email (Available February 10-March 26, 2016.